Created Cover art for CosgroveLab.org of SUNY Upstate Medical University. The protein model asset was provided to me by the CosgroveLab.org. My role was to create the 3d render and graphic design composition for the protein element. This is for the October 23rd 2015 Edition of Journal of Biological Chemistry. This is the 2nd time one of my compositions gets selected for the cover of the Journal of Biological Chemistry. On The Cover: The mixed lineage leukemia 3 (MLL3) core complex catalyzes monomethylation at histone H3 lysine 4 (H3K4). Unlike other MLL family core complexes, the WDR5 subunit of the MLL3 core complex inhibits H3K4 methylation activity. 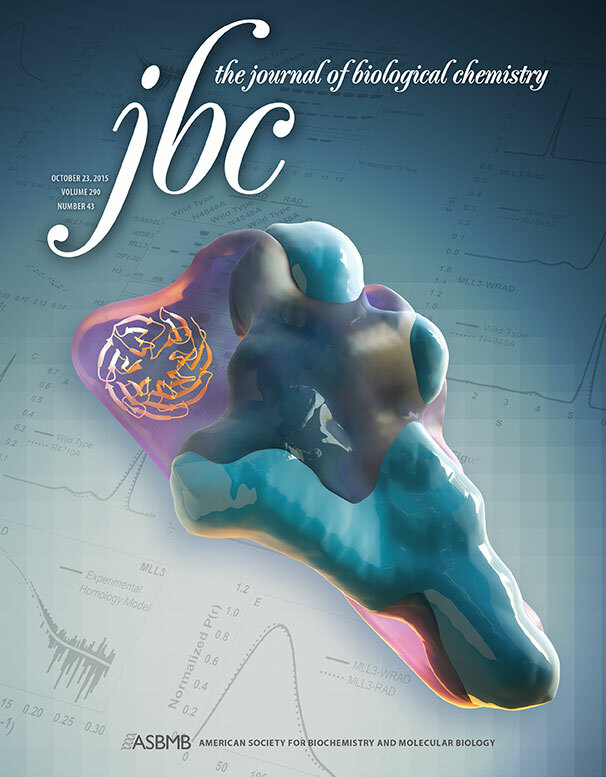 The cover shows the BioSAXS solution structures of the MLL3 core complex assembled with WDR5 (purple) superimposed with that of the core complex without WDR5 (blue). These structures give insight into the spatial location of WDR5 (orange) within the MLL3 core complex and its mechanism of inhibition. For details, see the article by Shinsky and Cosgrove, pages 25819–25833 (cover image by Victor Garcia).